Thermophotovoltaics: a potential pathway to high efficiency concentrated solar power A high temperature thermophotovoltaic (TPV) system is modeled and its system level performance is assessed in the context of concentrated solar power (CSP) with thermal energy storage (TES). The model includes the treatment of the emitter and the heat transfer fluid that draws thermal energy from the TES, which then allows for the identification and prioritization of the most important TPV cell/module level properties that should be optimized to achieve maximum performance. The upper limiting efficiency for an idealized system is then calculated, which shows that TPV with TES may one day have the potential to become competitive with combined cycle turbines, but could also offer other advantages that would give CSP an advantage over fossil based alternatives. The system concept is enabled by the usage of liquid metal as a high temperature heat transfer and TES fluid. The system concept combines the great economic advantages of TES with the potential for low cost and high performance derived from TPV cells fabricated on reusable substrates, with a high reflectivity back reflector for photon recycling. Rethinking Phonons: The Issue of Disorder Current understanding of phonons treats them as plane waves/quasi-particles of atomic vibration that propagate and scatter. The problem is that conceptually, when any level of disorder is introduced, whether compositional or structural, the character of vibrational modes in solids changes, yet nearly all theoretical treatments continue to assume phonons are still waves. For example, the phonon contributions to alloy thermal conductivity (TC) rely on this assumption and are most often computed from the virtual crystal approximation (VCA). Good agreement is obtained in some cases, but there are many instances where it fails â€“ both quantitatively and qualitatively. Here, we show that the conventional theory and understanding of phonons requires major revision, because the critical assumption that all phonons/normal modes resemble plane waves with well-defined velocities is no longer valid when disorder is introduced. Here we show, surprisingly, that the character of phonons changes dramatically within the first few percent of impurity concentration, beyond which phonons more closely resemble the modes found in amorphous materials. We then utilize a new theory that can treat modes with any character and experimentally confirm its new insights. The results have important implications for phonon interactions with neutrons, electrons and photons, since the momentum of non-plane wave phonons is currently unknown. Hamid received his B.S in Mechanical Engineering from Azad University in 2008. He then worked at Saipa Heavy Die Manufacturing Corporation for several years as a quality control and manufacturing engineer. In 2013, Hamid completed his M.S in mechanical engineering at university of Missouri-Columbia with thesis research in molecular dynamics simulation of evaporation and boiling over nanostructured surfaces. 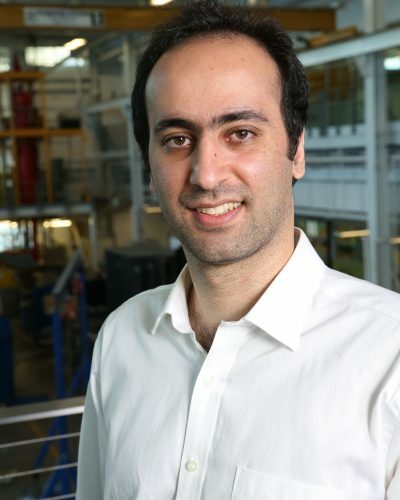 Hamidâ€™s past research experience has been in computational fluid dynamics, electronic cooling, porous media, heat pipes, nanofluids, nanoencapsulated phase change materials, resin transfer molding processes, and turbulent flow. He is currently working towards his Ph.D. degree, in the Atomistic Simulation & Energy Lab with Dr. Asegun Henry, focusing on phonon transport and thermal conductivity in disordered materials. Hamid is also working on analyzing concentrated solar power systems with high temperature thermal storage that utilize thermophotovoltaic modules as a power cycle.